FINALLY! I have the rag quilt pattern finished for you all. 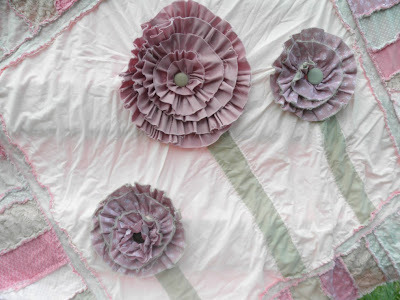 This is a really fun Ruffled Flower FREE Rag Quilt Pattern. It is my way of thanking you all for following me on this journey of mine. I was inspired by the big flowers that I have been seeing popping up around blog land. I showed my mom this blanket the other day and her response was "I just saw a purse with a flower just like that and I want one." This is fabulous! I don't really quilt....I have started one, and yea....that's it I've started it. I have to finish it by Friday though :) I love the flowers! This is so adorable. I just printed mine out and hope to get to it soon! Thanks so much. Bobbie that is adorable i am going to have to find someone to make this for. I love it, you are such a talented girl. Wow!!!! This is gorgeous! Thanks for so generously sharing your pattern. Thanks for sharing this great pattern Bobbie! Love the flowers! I LURVE this! Thanks for the free pattern!!! Nice! I can use that on custom drapery jobs as accents! thx! Ooh, I'm so glad you posted a link on my perpetual party! I had already noticed your post but hadn't gotten around to linking it myself yet. Just lovely! The texture is so appealing. Please visit again soon! How cute! Love the big flowers. Dropping by from Met Monday, 18ft island kitchen. I love this.. so unique and different.. you've inspired me to take out my quilting..
Sooooo pretty! I love it, want it - now! =) Coming over from BNOTP and a happy new follower! Oh WOW...I love this, thanks for sharing. 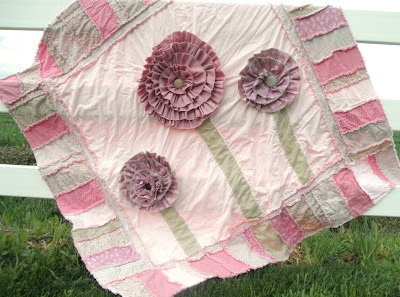 I found your blog on TTA..so glad that I did..I have wanted to learn to sew quilts for-everrrr! I love this one..the ruffle flower is so pretty!!! Oh, it's very cute. I love it! Thank you for sharing this with us...it is gorgeous! Adorable! 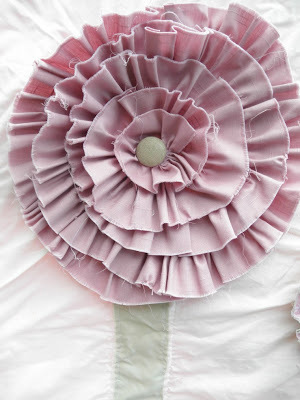 Thanks for linking @"Sew Cute Tuesday"! this is freaking beautiful! i literally adore it! O my goodness, this has to be my new favorite!!! This is sooo darn cute. Just adorable! 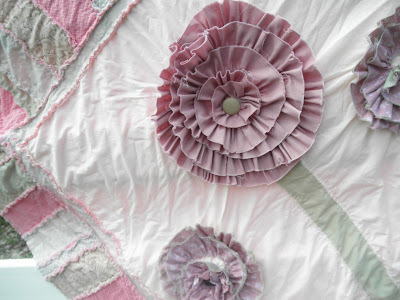 I love rag quilts and this is the prettiest I have seen. I'm going for the pattern, thanks so much!! Thanks so much for the pattern Bobbie! This is an absolutely darling quilt! I finished making the car seat tent from one of your kits, and I love it. You are so talented! Are you kidding???? This is too funny! I am following the request to visit the person before and after mine. I am glad it was you. I have been wanting to make a quilt like this and now I have the instructions! Thanks so much! I'm off to read more of your blog. From rags to riches...this is a winner! Oh wow, those flowers are amazing!!! I love the rosettes on the quilt. And how cool that you offer the pattern! This post, or one like it would be great to link to my Tips & Tricks linky party. Oh WOWZERS that is adorable! I love it! Thanks for linking it up to Hoo's got talent! I love this!!! We are getting ready to open up a clothing pantry and there are always clothes that are torn or stained but the fabric is still in great shape. I am wanting to teach the girls how to sew and wouldn't this be lovely to make out of the fabrics and then sell them in a shop so they could learn the art of earning money for their wares!! Thanks so much for sharing the pattern with us!! Love the flowers...so pretty. I am a very impatient, non-perfectionist sewer but I love rag quilts....their about the only thing I sew. I just may try this. Thank you! I am trying to down load the pattern and it won't let me. HELP I have got to try this. This just precious! Definately think this may be my first quilt! I have been chicken to try one, but this is just so cute I have to try it! 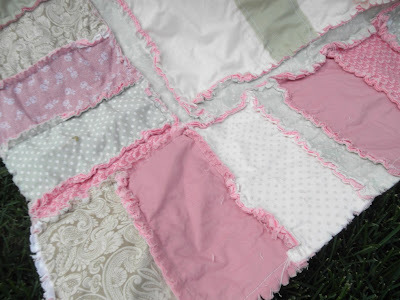 I love ragged quilts. This is absolutely gorgeous!!! I like to make pieced curtains for my side door; it is in the kitchen by the sink. This would be perfect. Thank you. I don't quilt (yet ;) ) but this looks like something I could handle - and it's beautiful! These patterns are all beautiful. I wish that I had the time to make these beautiful quilts.